When operating a small business, many small things can have a huge impact on your bottom line. Every successful customer interaction carries a certain value that begins to accumulate over time. If your business collects enough of this currency, it will hopefully lead to what every business strives to obtain – a customer referral. Referrals offer perhaps the most value of any single nonmonetary interaction with a customer. Not only does a referral offer the potential for future business, it also signals the acquisition of social currency, which your business can spend on improving its reputation and growing its brand. Social currency is a concept that has started gaining a lot of attention in marketing but boils down to something that most small business owners already have an intimate understanding of – that word-of-mouth referrals carry enormous value. When a customer takes the time to personally recommend your business to a friend or colleague, they are using social currency to make it easier for people in their social circles to trust that your business will provide them a fair service at a fair price. A 2016 Harris Poll Survey found that over 80 percent of American seek out a recommendation when making a purchasing decision, and that when someone talks about or mentions a brand on social media, a correlation exists that corresponds directly to purchasing behavior. The results of this and other recent studies paint a compelling picture that shows us referrals don’t simply help people make decisions, they’re the primary driver of them. If your business wants to significantly increase the number of referrals it receives, then you need to dramatically redefine what a referral means to you – A customer referral doesn’t represent an opportunity to gain new business, it’s actually an opportunity celebrate and show greater appreciation to your current clients. Once you adopt this improved philosophy, you’ll start to see improved satisfaction in your current customers and far more new ones as well. Whether your business operates as a B2C or a B2B, the way you view a referral should be the same. At its core, a referral isn’t simply a lead on new business, but rather a validation that you’re providing value to your current customers. With each new referral you receive, take the time to first thank your current customers before sending off a rushed email or phone call to your new lead. Additionally, many businesses only take the opportunity to thank a customer for a referral if it leads to new business. This is a huge mistake. The immediate value of a referral doesn’t come in the form of potential new business, but in that a current customer has taken the time and made the effort to support and validate you. By recognizing and celebrating that effort regardless of a referral’s outcome, you improve customer satisfaction and lead to more referrals in the future. Changing the way you think of a referral might not come naturally, so here’s a simple framework for how to develop this new approach. Step 1.) Earn a referral. While this acts as a central foundation for every successful business, it often gets overlooked – If you want more customer referrals, you need to make them happy by providing exceptional value. Make this the focus of your business, and ensure that customer satisfaction always stays at the center of everything you do. Soon, you won’t need to ask customers for a referral, they will happily provide one without you even needing to ask. When you stay focused on obtaining new business leads, you ask customers for a referral because it helps to grow your bottom line. However, when you feel confident that the services you provide actually help your customers’ businesses succeed, you want to provide your services so that you can help those they refer succeed as well. 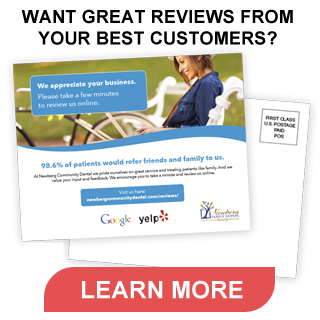 Immediately following a referral, your first thought shouldn’t be, “Excellent! This will really help my business,” but rather, “Excellent! This will really help my customer’s friend.” By focusing on the value you provide, it’s easier for customers to see how referring you can improve business for everyone involved. It means a lot for someone to refer a friend, family member, or colleague. They’re putting their reputations at risk you and spending some of their own hard earned social currency to recommend your business. As a result, they need to know that you will treat this new chance at business as more than an opportunity to grow your bottom line. They want to know that you’ll honestly assess whether the services you offer actually make sense as an appropriate solution for their friend’s needs and that if they become a customer, you’ll provide the same type of outstanding service that earned you a referral to begin with. This starts with making a commitment to providing outstanding service and value every time to every customer. Finally, we come to the heart of the issue. Keep in mind that a referral is not just a sales lead, it’s an enormous vote of confidence from a customer and the ultimate validation that your business truly provides exceptional value. Getting a referral should be a cause of celebration for your entire business. It’s at that very moment, a customer is saying publicly that your business not only provided them value, but that it can provide others value as well. Take a moment to reach out to that customer and express your gratitude for their vote of confidence. Encourage other members of your staff to do so as well. Overall, this new way of thinking helps to generate positivity to your business, your team, and your customers and their network of friends and associates. Redefining customer referrals as an opportunity to express customer appreciation will create a cycle where referrals generate appreciation and appreciation generates referrals. Positive cycle where everyone wins in the end.